New Classes at Lost Cities! We now have classes scheduled through May. We will be featuring basic and intermediate classes taught by our in house teacher, Robin Dye. Sign up for any of the classes mentioned in this newsletter by either visiting us in person here at the store, or paying over the phone with credit card. Payment is required to reserve a space. The minimum class size is two students and maximum is six, so make sure you sign up early to secure your spot. Lost Cities reserves the right to cancel or reschedule any classes that do not meet the minimum of two students. Payment for classes will be refundable up to 48 hours before the class, so please let us know as soon as possible if you're not able to make it. We ask that students be at least 15 years old and accompanied by a paying adult. Please, no non-paying guests while classes are in session. We want your class to be about YOU. Lastly, please keep in mind that in order to devote our full attention to our students, Lost Cities will not be open to the public during class hours. I hope I've been able to answer all of the questions you might have about the classes, but if you still have questions, please let me know. Robin and I look forward to seeing you soon! 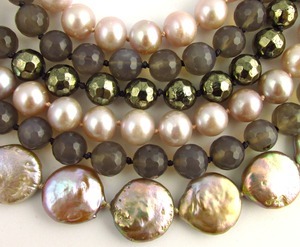 Learn the basics of bead stringing along with an introduction to the basics of design. This is a great class for those who are new to beading, or might need a refresher on simple construction and design theory. Robin will help you to create a simple strung necklace and an elastic bracelet. This beginner class will teach you the basics of using wire to create connections, wired dangle earrings, and wire-wrapped pieces incorporating sections of chain. 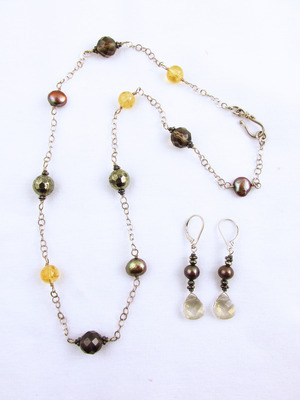 Robin will help you create a pair of simple drop earrings and a necklace. This beginner class will teach you the basics of beginning knotting with silk string using specialized knotting tweezers. 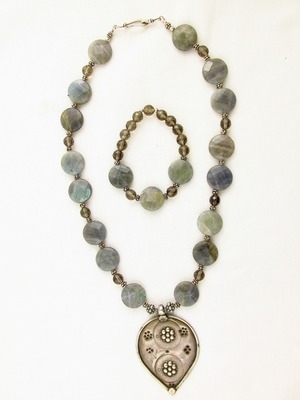 Robin will assist you in creating and completing a knotted necklace of pearls or stone. One of our most popular classes! 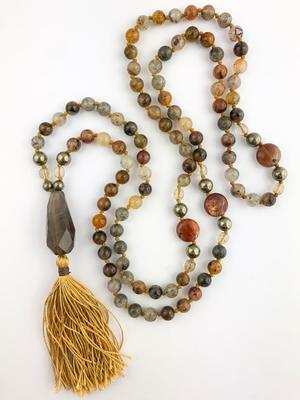 In this beginner class, Robin will guide you through the significance, basic history, and construction of this meaningful necklace. You'll learn how to arrange your design, hand-knot with specialized tools and finish your project with a handmade (by you) silk tassel. 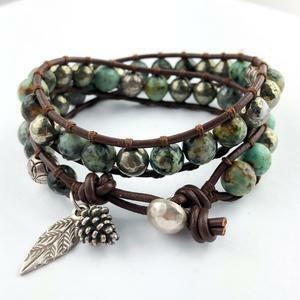 bracelet of gemstone beads and leather. Robin will also show you how to end it with a fashionable button closure.